E coli (Escherichia coli) and Salmonella bacteria are commonly found in the digestive systems of humans and animals. 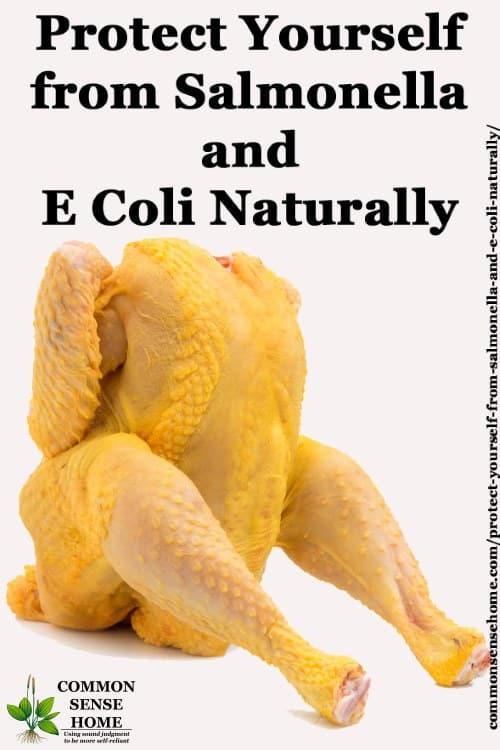 The CDC states that: “Most E. coli are harmless and actually are an important part of a healthy human intestinal tract. However, some E. coli are pathogenic, meaning they can cause illness, either diarrhea or illness outside of the intestinal tract.” The term “Salmonella” is used to cover roughly 2,000 similar types of bacteria, which vary in degrees of potential illness. How do with get infected with the types of e coli or salmonella that make us sick? 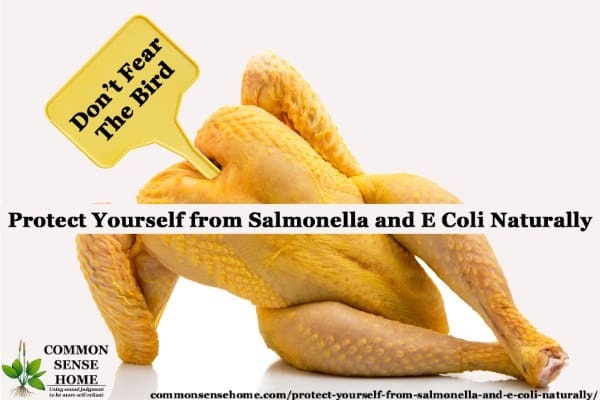 From the CDC:, “The types of E. coli that can cause diarrhea can be transmitted through contaminated water or food, or through contact with animals or persons.” Salmonella behaves in a similar manner – which is why we see illness outbreaks connected to food recalls. According to WebMD, reptiles, baby chicks and ducklings, and small rodents are particularly likely to carry salmonella. Thorough hand washing should always follow handling these types of animals. So why do some people get sick when exposed harmful bacteria, while other do not? If you are exposed to a very large amount of a pathogen, your risks increase dramatically. Some strains of bacteria are also more virulent than others. People with depressed or immature immune systems are also at greater risk, such as the very young, the very old, and those already dealing with illness or treatments that involve weakening the immune system, such as chemotherapy. Inhibiting levels of microbial pathogens: L. Acidophilus may inhibit pathogens by lowering the pH in the intestines. The production of organic acids effectively lowers intestinal pH to a level that is beneficial to good bacteria and destructive to pathogens. Protecting the immune system. Some research ( see link at right) shows that L. Bulgaricus and L. Casei are the truly effective strains for this function. Preventing establishment of harmful fungus and parasites: L. Acidophilus and B. Bifidus aggressively attach themselves to the walls of the colon. In doing so, they may inhibit Candida albicans, bacteria and the parasite Giardia lamblia. Lowering levels of toxic by-products: Harmful bacteria can produce toxins, such as indole, skatole, and methane because of their metabolic reaction to certain foods. Reducing their numbers may lower toxin levels in the colon. The meat industry is starting to take note of this, and introducing probiotics to chickens and pigs to reduce the incidence of salmonella. While I always consume probiotics during illness, maximum resistance to food-borne illness results from continually consuming live culture foods. Indeed, some studies have shown that introducing certain probiotics after salmonella has already infected the body does not improve healing. For recipes for probiotic foods, visit the “Live Culture Foods/Probiotics/Ferments” section of the Recipes page, and more about the role of probiotics in fighting illness in the post, “Preparing for Cold and Flu Season – Step #1- Probiotics“. What Do I Do If I'm Already Sick? If you have stomach flu type symptoms and are not sure if your illness is viral or bacterial in nature, you may want to consult my post: Coping With Stomach Flu Symptoms. Herbs for Salmonella treatment – Garlic, eucalyptus, wormwood, juniper, goldenseal, sage, ginger, acacia, grapefruit seed extract, Terminalia spp., Punica spp. Learn more about Herbal Antibiotics. Wash your hands, cutting boards, dishes etc with hot soapy water before handling food. Separate raw meat, poultry, and seafood from other foods in your refrigerator. For instance, you can fill this Inflatable Salad Bar with ice to keep food cool. I prefer wood cutting boards over plastic, as they are naturally antibacterial. You can read more about the antibacterial properties of wooden cutting boards, as well as care instructions and additional kitchen food safety tips in the post, “Why Wooden Cutting Boards are Best“. Do not eat raw greens contaminated with salmonella or e coli. The source of the bacteria is the water that they use to water the plants, and CANNOT BE WASHED OFF, since it is inside the plant. Return or dispose of the greens, and clean areas (like the crisper drawer in the refrigerator) that they touched. NOTE: Do not compost the romaine lettuce involved in the November 2018 recall contaminated with E. coli. (O157:H7), unless you have a very hot compost pile. It takes temperatures of 160 degrees Fahrenheit over 10 days to kill the particular strain of E. coli. (O157:H7) in the current romaine lettuce contamination. While the composting process occasionally reaches, and sometimes exceeds, temperatures of 155 degrees Fahrenheit in the Borough’s open windrow composting method, there is no guarantee the processing will hit 160 degrees Fahrenheit for a full 10 days, especially in the winter. This correlates to the results of a recent study that indicate some E coli may have increased heat resistance. The article “Ground beef may need higher cooking temperature to be safe” notes that a suite of genes has been discovered that gives some E coli bacteria increased heat resistance. They refer to this as the locus of heat resistance, or LHR. Approximately 2% of both pathogenic and non-pathogenic E coli carry this genetic trait. They are still working to determine updated cooking guidelines. If you found this post useful, please considering sharing it. Originally posted in 2011, updated in 2018. Great information. Thank you so much! You are always a wealth of great information. I appreciate this post. I have been trying to convince my family to eat lactic fermented foods for a while now, and I think this post makes a pretty good argument. The boys are bound to see the benefits after they read this. Thanks so much! Fermented foods can be hard for people to get used to, especially since many of us have palates trained to sweeter foods. I keep experimenting with my family. Some things go over better than others, and friends and neighbors help me eat the rest! I wouldn't be without live culture foods as a part of my diet now that I've experienced their benefits. Great post! I love your common-sense and well-researched approach. We also use garlic and ginger (as in very flavorful ginger beef, or even just plain garlic) when friends have tummy upsets, and we rarely get them; that's not the same thing as bacterial infections, of course, but it's another thing to think about. Great post! Maybe I can get my hubby to remember to take his probiotics if he reads this! Thank you for sharing! Humble homemaker – you're welcome and good luck! Probiotics have many health benefits. Wash your hands as much as possible when handling food especially if you are the one handling the food. Sharing on my FB page now. Thanks. Activated charcoal is also good for food poisoning. There is a Chinese herbal formula that works great for food poisoning and stomach flus. It’s called Huo Xiang Zheng Qi Tang/Shui, and you can get it in Chinatown. I’ve also seen it in some health food stores. Take at the earliest onset every two hours until symptoms subside…works like a charm. But if you feel veganism is right for you, but all means, follow your passion. Have you spoken to your doctor about your concerns? That would be my first suggested course of action (even though they may not listen). I really enjoy your posts, but I simply couldn’t read this particular one and NOT post. You stated above that “E coli 157:H7 bacteria is perfectly healthy and safe, as are many other strains.” – this is possibly the most deadly strain of this bacteria. I am a qualified, professional, food safety manager based in Ireland. I can tell you that E.Coli poisoning causes extreme illness and in a lot of cases death through hemorrhagic diarrhoea and kidney failure. I think that you need to do some serious research on topic like this, before you start giving medical advise to people. I also think you need to state that you are not a doctor at the beginning of this article. Raw manuka honey will not stop an already present salmonella or e.coli poisoning. This requires serious and quick medical treatment. E.coli is found in dirty water, raw milk and undercooked meats. It can also be found on unwashed vegetables where the soil was contaminated. Please be more careful with what you are recommending! Also, wood is not naturally antibacterial, and will actually promote the growth of pathogens on your chopping board. Thank you for correcting me on the e coli strain. I have made the correction in the post and added additional information to clarify. To make this even more obvious, I added it again at the beginning of the post. There is at least some research suggesting that raw manuka honey is effective against e coli, specifically: “Comparison of the Antibacterial Efficacy of Manuka Honey Against E.faecalis and E.coli – An In vitro Study“. Still, rather than risking someone ignoring the advice to seek medical help in case of serious illness and self medicating with honey, I removed this section of the post. I added information on those who are most at risk, and the risk associated with ingestion and/or contact with large amounts of pathogen. I also added information about animals that are most likely to transmit the pathogens, since kids like to handle critters and then put their hands near their mouths.